Todd Montanaro grew up in Rhode Island and started drawing and painting at an early age. He studied studio art at The Art Institute of Chicago, The School of Museum of Fine Arts, Massachusetts College of Art, and through multiple workshops with nationally renowned artists such as Don Demers, Bill Davis, Joe McGurl, Joe Paquet, David Curtis and Stapleton Kearns. He began exhibiting and selling his work in 2002. 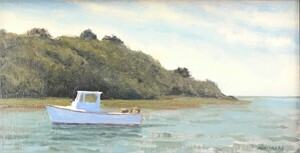 His work has encompassed many subjects, but has been focused recently on coastal landscapes and cityscapes of Boston. Whether painting a still life set up in his studio, or painting a landscape on location, Todd prefers to paint directly from life. He also paints larger landscape paintings in the studio based on information gathered from studies done on location. 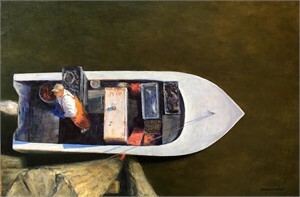 Todd is a juried member of the Copley Society of Art, the Cape Cod Art Association, and The Oil Painters of America. Charles Fine Arts, Gloucester, MA. View more of Todd Montanaro's Paintings on our marketplace. Todd Montanaro Todd Montanaro grew up in Rhode Island and started drawing and painting at an early age. He studied studio art at The Art Institute of Chicago, The School of Museum of Fine Arts, Massachusetts College of Art, and through multiple workshops with nationally renowned artists such as Don Demers, Bill Davis, Joe McGurl, Joe Paquet, David Curtis and Stapleton Kearns. He began exhibiting and selling his work in 2002. His work has encompassed many subjects, but has been focused recently on coastal landscapes and cityscapes of Boston. Whether painting a still life set up in his studio, or painting a landscape on location, Todd prefers to paint directly from life. He also paints larger landscape paintings in the studio based on information gathered from studies done on location. Todd is a juried member of the Copley Society of Art, the Cape Cod Art Association, and The Oil Painters of America. Recent Juried Exhibitions: 2015 The Guild of Boston Artists Regional Juried Competition Copley Society of Art, Holiday Exhibit (Won Award of Merit) The Creative Art Center of Chatham, Members' Exhibition (Awarded First Prize in Oil Painting) The Museum of America and the Sea (Mystic Seaport, The 36th Annual International Marine Art Exhibition) Cape Cod Museum of Art, Structures and Remnants: Landscape and the Human Presence Cape Cod Art Association, The All Cape Cod Exhibit The Creative Art Center of Chatham, The All Cape Cod Exhibit 2014 Cape Cod Art Association, The All Cape Cod Exhibit Cape Cod Art Association, The National Exhibit Cape Cod Art Association, The All New England Exhibit The Creative Arts Center of Chatham, The All Cape Cod The Creative Arts Center of Chatham, Members Show 2013 The Guild of Boston Artists Regional Painting Competition (awarded the Bronze Medal) The Creative Arts Center of Chatham, Members Show (awarded second place in oil painting category) Cape Cod Art Association, The All New England Exhibition The Creative Arts Center of Chatham, The All Cape Cod The Creative Arts Center of Chatham, Members Show Gallery Affiliations: The Copley Society, Boston, MA Gallery Antonia, Chatham, MA Thanassi Gallery, Provincetown, MA The Maritime Gallery, Mystic, CT Charles Fine Arts, Gloucester, MA. View more of Todd Montanaro's Paintings on our marketplace.